Ernst Aebi, both the man and his film, "Barefoot to Timbuktu," embodies the ideals of Mountainfilm in Telluride, this year May 28 – May 31. The annual gathering of a tribe, more evangelists really, is dedicated to saving the world one person, one place, one species, one story or idea at a time. His emotional journey of hope, anticipation, and desire finally gets told in "Barefoot in Timbuktu," a documentary about a wild and crazy adventurer and his obsession with the Sahara desert and its people. 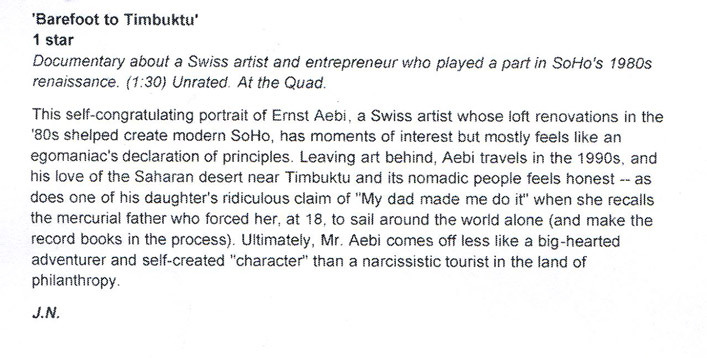 Aebi is Indiana Jones with a socio-environmental consciousness. 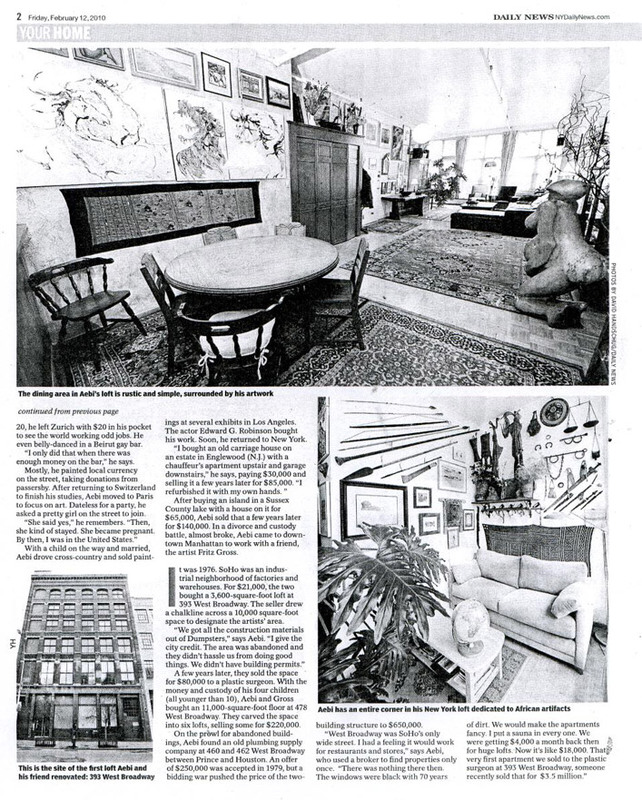 Telluride Inside and Out, May 24, 2010 - Article features audio interview with Susan Viebrock! Indeed, with his German accent, windblown appearance, wanderlust and obsession with impossible quests, Aebi often uncannily resembles that cinematic visionary/slavedriver Werner Herzog. One cannot but wonder what a Herzog docu on the subject of Aebi would look like. Who's the coolest movie protagonist in town? Who's the coolest movie protagonist in town? Gibson, Travolta, Downey, Washington? 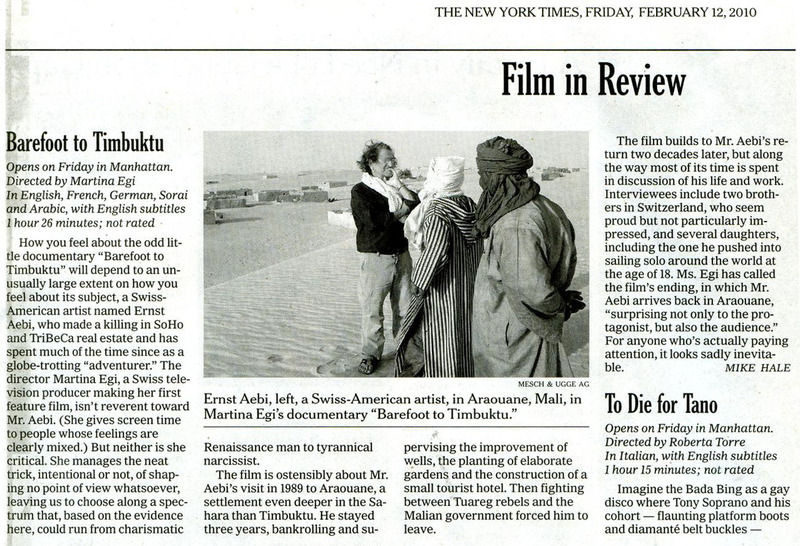 Beginning Friday, my choice is Ernst Aebi, the subject of Martina Egi's documentary, Barefoot to Timbuktu. EA: You should never stop. As long as you go you can hope something new comes your way and makes life more exciting. You don't want stagnation. EA: Actually, what our parents told us from an early age was that it was not allowed for us to say, "It can't be done." Nowadays our parents would be thrown into jail for the things they made us do or let us do. Egi does a terrific job of bringing out Ernst’s warmth, wisdom, sense of humor, unadulterated charisma and kindness of heart throughout his many interviews. 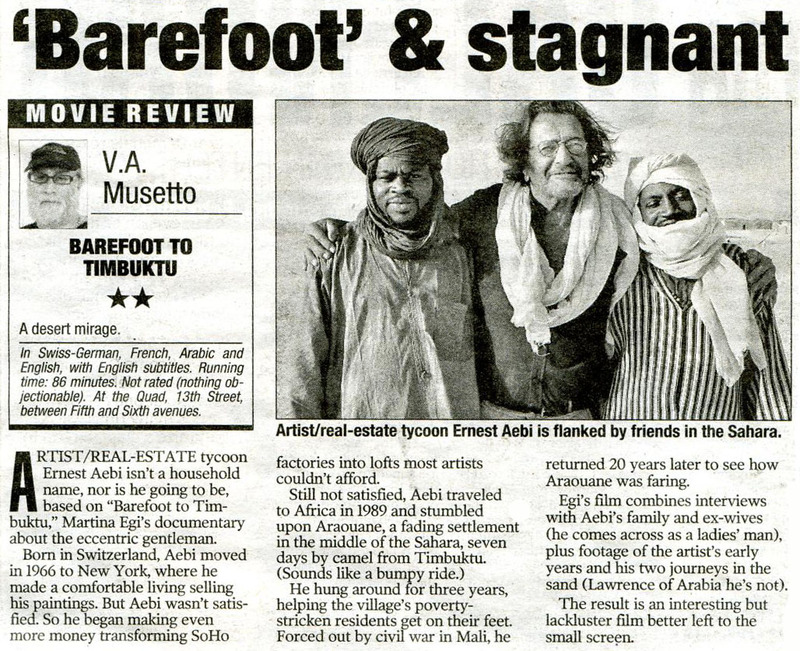 At a running time of only 84 minutes, Barefoot to Timbuktu manages to be captivating, inspirational and profoundly illuminating. The movie as a whole is so cinematic, narratively and visually, in ways many viewers don’t instinctively attribute to documentaries. Director Martina Egi has crafted a portrait of a daring and dashing character who seems adverse to a sedentary life and thoroughly disinterested in boundaries or obstacles. comingsoon.net: Ed Douglas’ review + chosen film of the week! To call Aebi eccentric may indeed be the understatement of the century. 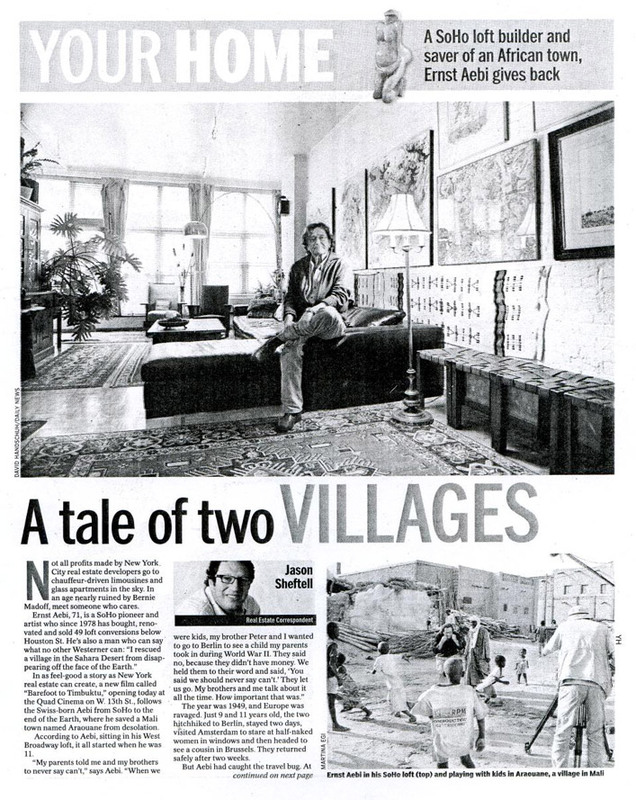 (...) inspiring to watch and Martina Egl has done a good job finding an inventively artistic way of telling his story. Review @ comingsoon.net: February 9, 2010 / Ed Douglas. Also his chosen film of the week! New York Magazine, February 15, 2010: Bilge Ebiri’s capsule review, and also one of the editor’s pick for the week. Egi profiles Ernst with affection, but she doesn't shy away from examining the effects of his restless nature on his family and friends. 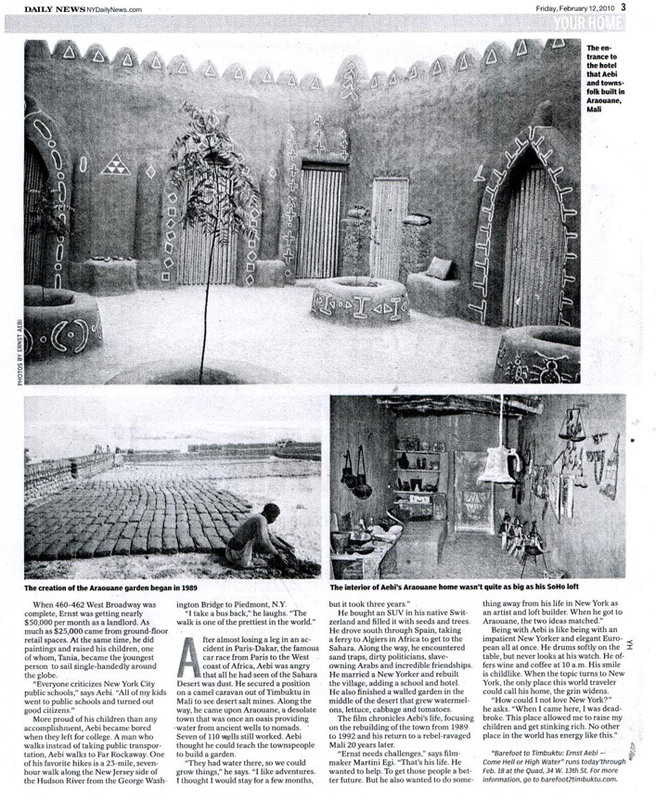 Martina Egi is interviewed by Filmmaker Magazine / Brandon Harris. It’s a full-life well worth getting to know.